Thanks to all of those who entered my SECOND $700 In 7 Days” Social Giveaway” … if you didn’t enter, or win a prize, then you MAY get one more chance: I’m thinking about running one more similar contest before Christmas. 1st Prize of $350 cash (as selected by Random.org) goes to Marilyn (user name = mnihill) … congratulations!! So, here’s how it worked: Trisha entered the contest after reading my announcement post and invited some friends to enter – and some of those friends invited their own friends. One of those ‘friends of friends’ was lucky enough to win the first prize, so Trisha won a 3rd prize for indirectly referring her. Barbara won second prize because she actually did refer the lucky winner! 5th Prize of $50 cash (as selected by Random.org) goes to Marie (user name = lwarren26). Congratulations to the winners: please contact me [ajc AT 7million7years DOT com], using the e-mails that you provided when you entered and either send me a PayPal invoice for the prize that you won (apparently, this is very easy to do and makes sure that I don’t make any mistakes and pay the wrong person!). If I don’t receive the required confirmations by the end of the week, your prize goes to charity! Speaking of the ‘more bug’ I want MORE people to enter my latest contest … so far, I have given away $1,300 in cash and gift cards as I test a new project that I’m working on. Once you have entered, simply let your friends know the User Name that you chose, and when they enter (using your user name) and win a prize, so do you! Now, here comes the twist: when they enter they will be able to invite their own friends, not only will they win a prize if one of their friends wins a prize, but SO WILL YOU. Your chances of winning a prize (of $50, $150, or even the $350 first prize … all in cash) can easily be 7, 15, 27, 56, … or MORE than in any other type of giveaway contest! $700 in 7 Days Social Giveaway! This is my SECOND EVER “$700 In 7 Days” Social Giveaway”, just in time for Xmas … why ‘social‘? In exactly 7 days I am giving away $700 cash with a $350 first prize and the remaining $350 split between whoever referred the winner to this page and who referred them and so on … There are NO CATCHES (other than I will only pay by PayPal transfer). I just want to say thank you! WOW I am still in shock that I won the contest…. it was a great Thanksgiving Day Surprise. Congrats to both Steve and Trisha who won prizes as well. If you refer your friends using the link below and they enter USING YOUR USER NAME as the person who referred them (eg “Steve12”), then if they win a prize so do you! If anyone you invite, or anyone they invite, or anyone they invite (…and so on) win money, then so will you! We’re giving $350 to the first User Name that we pull out of the hat, but that’s not all — we’re also giving $150 to the person who invited them. Then we’re giving $100 to whoever invited the inviter, and $50 to whoever invited them, and so on… until we have given away the ENTIRE $700! Angie joins the giveaway contest, selecting the User Name “Angie52”. 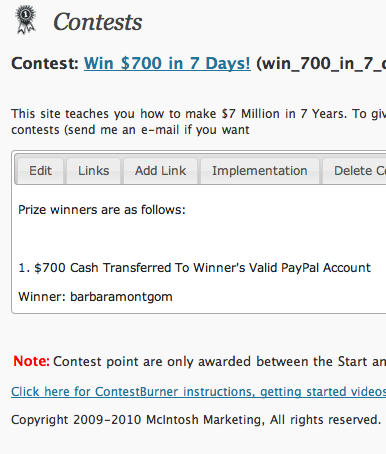 http://7million7years.com/contest/. … then his name is pulled out of the hat! Dave is the person who wins the main prize. Once that happens, we send Dave $350 via payPal for winning. Charlie gets $150 for inviting Dave, Bob gets $100 for inviting Charlie, and Angie gets $50 for inviting Bob. The remaining $50 is donated to charity. Easy and fun to win! 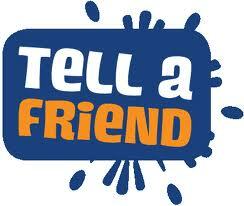 Remember: You only need to join to be in the running to win the $350 First Prize. 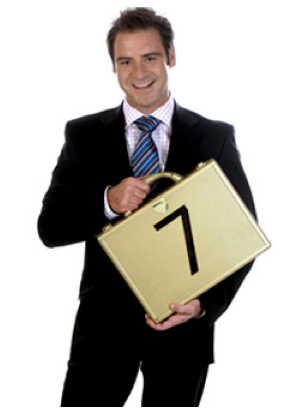 Then, if you also want to multiply your chances of winning a cash prize of at least $50 simply send this link http://7million7years.com/contest/ + your User Name to all of your friends … the rest happens automatically!